A study conducted by a team of researchers at Human Computer Interaction (MCI) Lab in Manitoba Canada, has revealed evidence that suggests that people can be prodded into doing something they don't want to do, by a robot. They've posted a blog entry on their web site describing an experiment they carried out to learn more about how people might respond to a robot boss, versus a human one, and the results they found. The experiment consisted of asking volunteers to complete different tasks, some fun (singing songs they liked), some tedious and boring (changing file name extensions for a very large number of files). 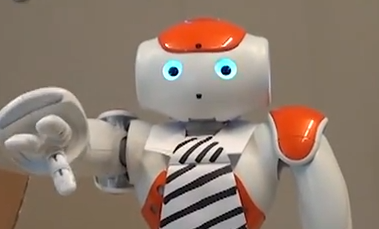 Some of the volunteers were asked to perform the tasks by a human being, others were asked to do the same tasks by a small friendly-looking Aldebaran Nao humanoid robot. The volunteers and their taskmasters were set up in an office-type environment, with desks set apart from one another. The participants were filmed as they carried out the experiment and the researchers analyzed the results afterwards. All of the volunteers were told repeatedly before the experiment that they could stop any task they chose at any time, with no negative consequences. In studying the video, the researchers found that 46 percent of the volunteers (both male and female) complied with a request to perform a task (which took 80 minutes) they didn't want to do, when asked to do so by the robot, compared to 86 percent compliance when asked by a human "boss." The researchers note the lower percentage but also point out that nearly half of those who participated complied when asked to do something they didn't want to do, when asked by a robot. The researchers also noted that many of the volunteers argued with the robot, and interacted with it as if it were human. Most apparently believed that the robot was issuing requests autonomously (it wasn't, a human being was behind a glass wall controlling things) and responded accordingly. They also found that some of the volunteers even tried bartering, either with themselves or the robot, by requesting another task or by suggesting out loud that perhaps the robot was malfunctioning. The research is being carried out to learn more about how future humans might interact with future robots in real workplace environments. The team's initial findings indicate that humans will not summarily dismiss a robot authority figure, and many will do as it asks. The team plans to continue with its research, no doubt, looking to find the limits of such interactions.